Routledge Introductions to Applied Linguistics is a series of introductory level textbooks covering the core topics in Applied Linguistics, primarily designed for those beginning postgraduate studies or taking an introductory MA course, as well as advanced undergraduates. Titles in the series are also ideal for language professionals returning to academic study. The books take an innovative ‘practice to theory’ approach, with a ‘back-to-front’ structure. This leads the reader from real-world problems and issues, through a discussion of intervention and how to engage with these concerns, before finally relating these practical issues to theoretical foundations. Exploring Digital Communication aims to discuss real-world issues pertaining to digital communication, and to explore how linguistic research addresses these challenges. The text is divided into three sections (Problems and practices; Interventions; and Theory), each of which is further divided into two subsections which reflect linguistic issues relating to digital communication. The author seeks to demystify any perceived divide between online and offline communication, arguing that issues raised in relation to digital communication throw light on language use and practices in general, and thus linguistic interventions in this area have implications not only for users of digital communication but for linguists’ general understanding of language and society. 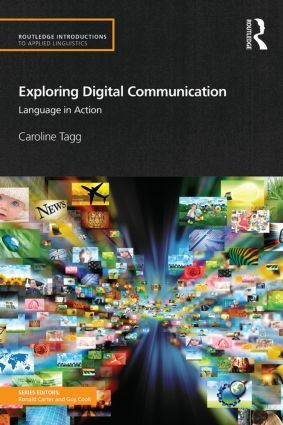 Including relevant research examples, tasks and a glossary, this textbook is an invaluable resource for postgraduate and upper undergraduate students taking New Media or Communication Studies modules within Applied Linguistics and English Language courses. Introduction: why focus on language in exploring digital communication? 1) Is digital communication detrimental to grammar and spelling? 2) Has the internet changed how we read? 3) Is the web devaluing what it means to be an author? 4) Does the internet further the global dominance of English? 5) From anonymity to self promotion: are we ever ourselves on social media? 6) What are the implications of social media for privacy? 7) Is social media making us less social? 8) What can be done about trolls and online bullying? Caroline Tagg is lecturer in the Department of English Language and Applied Linguistics, University of Birmingham. Her publications include The Language of Social Media: identity and community on the internet (edited with Philip Seargeant, 2014) and The Discourse of Text Messaging (2012).